The St. Bernardus beer with which we’re most familiar is the Abt 12, a Quadrupel that has a slight metallic sting to it that sort of tastes like blood. Ever since realizing this, the jolly drunken monk on the St. Bernardus labels has taken on a more sinister demeanor. After all, what is he so happy about? And what, exactly, is in that glass he’s holding? 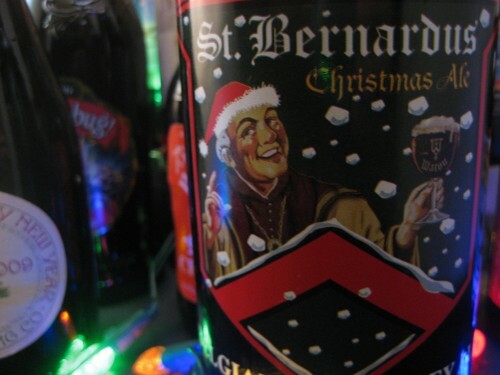 However, there’s nothing sinister about the St. Bernardus Christmas Ale. There are strong notes of cinnamon and nutmeg in the dark red beer with a fruitiness that settles in the back of the throat like a home made pumpkin pie. It has a strong head that erupts from the pour with an impressively long staying power. If we were to grade this on an arbitrary holiday themed rating scale (we aren’t), we’d give it five red mittens out of five.